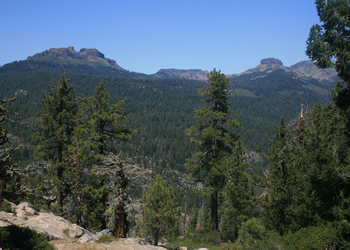 Donnell Vista is reached via a short one-quarter mile paved trail that leads to an amazing overlook of the Middle Fork of the Stanislaus River Canyon. 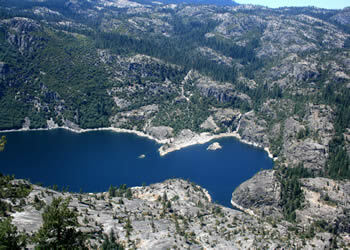 From this vantage point at an elevation of 6100, you see Donnell Reservoir 1,350 feet below, the Dardanells (picture below) and mountain peaks beyond as well as sweeping views toward the foothills to the west. As you proceed down the trail, you will see markers giving a brief synopsis of what happened in this area when the pioneers crossed this terrain. One can only imagine the difficulty that these people had in crossing the Sierra Nevada Mountain Range. As you look toward the west, you can see the dam in the background. 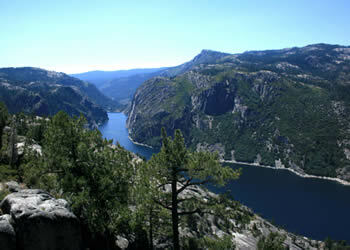 The dam is 4,747.76 feet above sea level, has a height of 291 feet and is designed to hold 56,893 acre feet of water. The dam was completed in 1958. Directions: From the Summit Ranger Station, drive east on Highway 108 for just about 15.9 miles to the Donnell Vista parking area on the left.